Find some books about Illusion magic to further your Illusion skills. Find the book in the Arcanaeum. Find the book in Hall of Attainment. Find the book in Hall of Countenance. Find the book in The Midden. Once you have level 100 (see bugs) in the Illusion skill, travel to the College of Winterhold. Once there, find Drevis Neloren. Ask him if you can learn anything more about Illusion magic. He will give you a spell, Vision of the Tenth Eye, and ask you to find four Master Illusion texts. You can only see these books for a thirty second period each time you cast the vision spell. The first book is on a table in the Arcanaeum. It is in the west on the outer ring. It appears on the same table as the book The Legend of Red Eagle. The second book can be found in the Hall of Attainment. On the landing of the upper level, at the top of the stairs, it lies next to a bench. The third book is on a barrel in the upstairs storeroom of the Hall of Countenance. This is the room opposite of the room with the Arcane Enchanter. 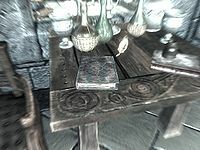 The last book is down in The Midden, on a table next to the Atronach Forge. Give all the books to Drevis Neloren and he will give you one of the four master-level Illusion spell tomes: Call to Arms, Harmony, Hysteria, or Mayhem. You can then also buy the other three tomes from him. The quest only requires a skill level of 90, but Drevis's opening dialogue has a requirement of level 100, which is inconsistent with the quest and the other master level quests. Sometimes the Master of Illusion Text books are not where they are indicated above (though they should be nearby). This is usually caused by using a spell near the location before the quest starts. Sometimes one of the Master of Illusion Text books will be marked as stolen in your inventory, making it impossible to give the books to Drevis and complete the quest. ? 200 Finishes quest I have found the Master Illusion Texts hidden throughout the College and delivered them to Drevis Neloren. In return, he has given me one of the Master Illusion spells. On the PC, it is possible to use the console to advance through the quest by entering setstage MGRitual02 stage, where stage is the number of the stage you wish to complete. It is not possible to un-complete (i.e. go back) quest stages, but it is possible to clear all stages of the quest using resetquest MGRitual02. This page was last modified on 1 February 2017, at 22:16.